H.E. 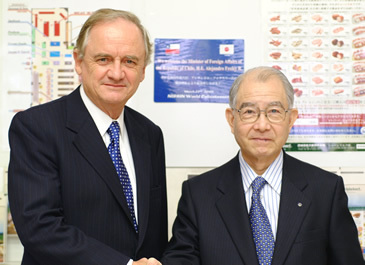 Alejandro Foxley, the Minister of Foreign Affairs of the Republic of Chile visited NISSIN on March 27 th, 2007. 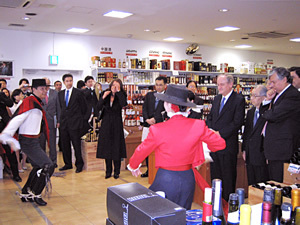 Greeted by Sanya Suzuki, the President of Nissin Meat Products Co., Ltd. and welcomed by entire staff of NISSIN. 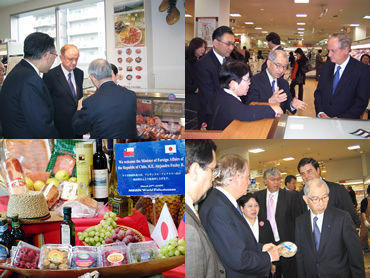 Mr. Suzuki showed him the Store and explained what NISSIN carries the products from Chile. 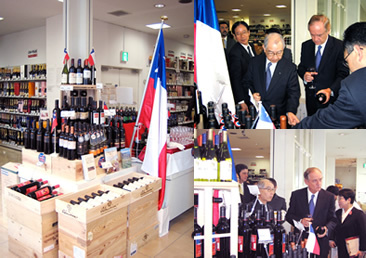 Mr. Foxley tasted Chilean wines at our Wine Department (3rd floor) and asked the staff about wines we have here. 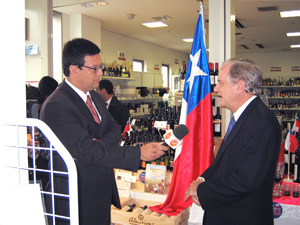 Mr. Foxley was interviewed in front of Chilean wine section. Exchanged the Gift and enjoyed Chilean folk dance with a glass of Chilean wine. It was our great honor to have Mr. H.E. Foxley here as our special guest and we appreciated very much for his visit.